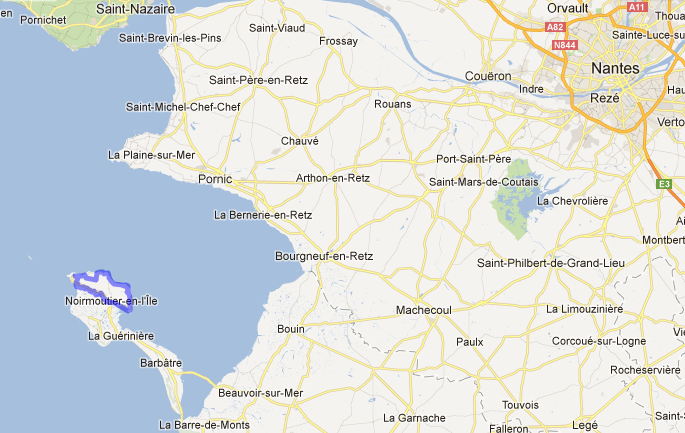 Noirmoutier is an island off the coast of France, in the Atlantic, just below Nantes and Brittany. We vacation here frequently as there’s a summer cottage of the family in a small town, Herbaudiere, at the far end of the island beside the port. The island is flat. So flat that at times with the combination of a high tide and a storm, at times the ocean has made its way completely over the island. It is just 12 miles long and only 4 miles at its widest beam. It is so flat that it is difficult to get lost; just look for the steeple of the church in the distance and you know where you are. Much of the island is made up of marshland, called Le Marais, which has been developed to created hundreds of small saltwater ponds where the locals make salt. Gourmet salt in fact. Salt that is known throughout France and that comes in a multitude of colors and flavors. It is graded and the finest is known as Le Fleur de Sel. On other parts of the island, on more firm land, they grow potatoes. The gourmet salt is actually graded, and there are good years of salt and bad ones, primarily depending on how much sun, wind and rain they get. Sun and wind together create the best salt yields. And because of the salt, potatoes grow here with a naturally salty taste, allowing some to say they are the best potatoes in all of France. Potatoes that are fertilized with sea weed that is collected from the beaches (therefore making the beaches more pleasing to visitors as well) and which add a natural saltiness to the potatoes and just like its salt, making Noirmoutier’s famous as well throughout France. We enjoy that all the homes are very similar; painted in white with blue shutters, and there are few ostentatious homes. This is not a place where neighbors are trying to out do the neighbors in size, volume or showy facades of rock or something else. Everyone’s house is white with blue shutter, which adds to the island’s flavor and uniqueness. The only place you see some that are somewhat extravagant is in the Bois de la Chaisse, where large brick and stone chateaus were built back in the late 19th early 20th century. Otherwise homes are small, no more than two floors, and nicely decorated with flowers and gardens. As with any small island, space is a serious consideration. Roads tend to be narrow, often less than the width of a single lane, therefore getting around is much better suited to something other that cars. In Noirmoutier the bicycle dominates. There are special pathways throughout the island just for bicyclists, and you’ll find people of all ages using them. From 80-year olds off to fetch a baguette for lunch to two-year olds being told behind their father’s bike inside a small trailer. In the summer it is a favorite family outing, with large groups traveling together from town to town, beach to beach, and through Le Marais. There is also one particular vehicle that is very popular and you’ll fine all around the island in different versions, shapes and colors. They aren’t made anymore, but one particular agency has made a good business out refurbishing older models. There are numerous bike trails leading to and from the small towns on the islands and through the salt flats and marches. I’ve mapped out a favorite trail of ours, which takes us through a number of small towns, beaches and the small forest of Le Bois de la Chaisse. La Passage du Gois is a road that connects the island with the mainland, just over 4 km. in length, but which is only passable at low tide, twice a day. And just in case some are late in passing, there are towers that have been erected that people can climb, to wait to be rescued or for low tide. If you aren’t that adventurous, there is a bridge that crosses at the lower end of the island.